We have two new sets of specialty tanks for sale! That’s right! TWO! surprise! The first is the standard edition of the ‘Heart’ Tank that we gave out for Valentines day and the other is the ‘Pot of Gold’ Tank we introduced for this years St. Patrick’s Day. Both tanks come in sizes from 10L to 100L. They have a hold pose that can be turned off via the menu and are able to be resized via the menu with :mused:’s new milk compression technology it gets smaller (or larger) without losing a drop! The Heart tanks are a plain clear glass heart shaped bottle and you can open and close the lid. 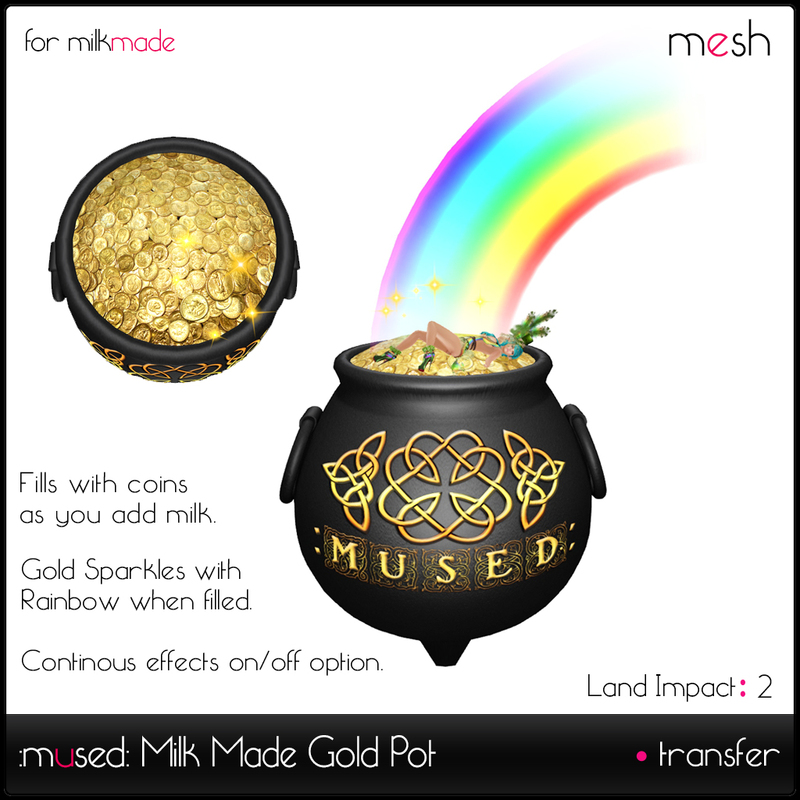 The Pot of Gold tanks will also allow you to set the Sparkle and Rainbow effect on all the time or have it only show when the tank is filled or you can turn it off entirely. These are for sale in the tank room of the main store, so be sure to swing by and grab a few! Filed under: Milk Made, New Releases, News | Tagged: Heart Tank, milkmade, new release, Pot of Gold, storage tank |	Comments Off on New tanks for Sale! We have become aware of a potential security issue with the hormones as such we are going to be doing an emergency update. This is for hormones only and it does not impact other bonus items in milkmade or Stud Pump. The new hormones are 1.10 and are currently in the vendors so any hormones bought from now on will be fine but any hormones 1.09 or older will only work until the evening of Monday May 11th. We will no longer replace older hormones after August 7th.